The STSA Brooks Scholarship was established in 2010 in honor of Past President, James W. Brooks, MD. The Scholarship funds the travel of a 2nd, 3rd, or 4th year medical student to attend the STSA Annual Meeting. 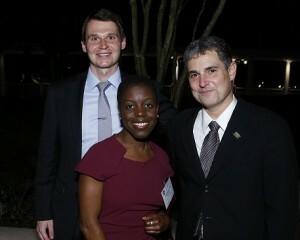 2015 STSA Brooks Scholar, Bogdan Kindzelski (left), attended an STSA 62nd Annual Meeting networking reception with Dr. Melanie Edwards and his STSA member mentor, Dr. Richard Lee (right). Bogdan recently shared feedback with STSA about his experience as a Brooks Scholar attending the November 2015 STSA 62nd Annual Meeting. What did you enjoy most about the STSA 62nd Annual Meeting and STSA Scholarship Program? The meeting was fantastic; the opportunity to learn about cutting-edge research in addition to networking with the cardiothoracic surgery community, from fellow trainees to leaders in the field, was particularly memorable. My assigned mentor was exceptional and provided great career advice, facilitated introductions, and made sure that I felt welcome throughout the meeting. The program only strengthened my decision to pursue cardiothoracic surgery based on my experience from the scientific sessions, excellent lectures, jeopardy event, social events, interactions with other members, and guidance from my assigned mentor. Was there anything about the STSA Annual Meeting that surprised you or stands out as different from your experiences at other national medical meetings? The collegial atmosphere established during the STSA Annual Meeting was truly unique. The social events provided ample opportunity for exciting conversations and laughs. It was a privilege to interact with so many individuals who were willing to share their insight into the field of cardiothoracic surgery. Everyone was cordial, approachable and truly vested in trainee mentorship and education. Have you included your Brooks or Resident Scholarship award on your CV, and if so, do you believe the designation adds value to your resume? Yes, it was an honor to include this designation on my CV. It has frequently become a talking point during my integrated cardiothoracic surgery interviews. My experience was exciting and enlightening. I would highly recommend any medical student considering cardiothoracic surgery to attend the STSA annual meeting and also to apply for the Brooks Scholarship. STSA is pleased to announce that funding has been secured for two medical student Brooks Scholars to attend the STSA 63rd Annual Meeting, November 9-12, 2016 in Naples, FL. The 2016 Resident and Brooks Scholarship applications will be available in late-May. Learn more about the STSA Brooks Scholarship and make a donation to help fund the program at www.stsa.org/awards. Contact STSA Headquarters with questions or to request additional information by e-mailing stsa@stsa.org or calling 312.202.5892.